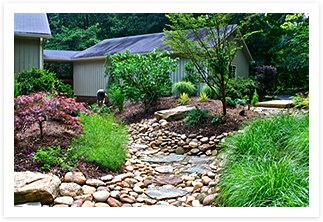 "Wilson's Natural Landscaping, LLC has been a partner in our garden success for the past 8 years." "We purchased a home with a mature, overgrown Landscape. Chad paid a visit to our garden and my husband and I spent an hour or so conveying our thoughts. Chad quickly came up with a plan that was executable and that paid respect to the existing vegetation. Wilson's Natural Landscaping, LLC provided professional pruning, feedings, a few removals and some great, quality planting additions. Now, with Chad and the team managing the plantings monthly, we have a truly lovely garden to enjoy and share with our friends!!" "We met chad through a mutual friend. Our infant had just been born and her bedroom was in an area of the home that got very hot due to the summer sun blazing through the windows. Chad and Mike came out and installed 3 lovely, LARGE Maple Trees that now provide the room with shade. As a bonus, our daughter gets to "live in the trees" as she looks out of her bedroom window! These guys know their trees!" "My wife and I interviewed a few firms before Wilson's Natural Landscaping, LLC came to us as a referral from one of my peers at work. Chad immediately understood our woodland garden needs and came up with a simple, natural feeling plan that allows us to use and enjoy our wooded space. We have a special affinity for the small natural stone patio and native Azaleas that were incorporated. We highly recommend these men for your woodland garden needs." "Our neighbor decided to make a nice addition to their property by building a two story garage. We were happy for them but did not necessarily want to look directly at this new mass of brick. Chad came out, provided us with 3 options, priced a variety of sizes and thoroughly explained each plant's growth patterns, expected size at maturity and provided truly exceptional advice. Today, the garage is disappearing behind a large growing mixed border of evergreen plantings! Without hesitation contact Wilson's Natural Landscaping, LLC for privacy needs!" "I lived in Charlotte most of my early life, moved away and returned 3 years ago. I had a longing to recreate a true Southern Garden that I grew up here with. Chad and his team truly had an extensive knowledge of Southern Heirloom plants and design. I am very happy with "Old Charming Garden" that is only 4 years old- it feels 50 years old! The team at Wilson's Natural Landscaping, LLC was extremely responsive, helpful and polite. They are a joy to work with." "Let me just say Mike and his team get the job done. Mike, Chad and the guys were at our home for 3 full days of work. They executed the plan masterfully and were extremely polite and accommodating men. Thank you!"